Vijayalaya Choleeswaram in Narthamalai, a panchayat town in Pudukottai district in the South Indian state of Tamil Nadu, is a temple dedicated to the Hindu god Shiva. Constructed in the Dravida style and rock cut architecture, the temple is believed to have been built during the 9th century by Muttaraiyar kings, the cardinals of Pallavas, with later expansion from the Cholas. The rock-cut architecture is an early example of Cholan Art, continuing the tradition of the Pallavas. The other portions of Narthamalai houses the 8th century Jaina Abode, the Aluruttimalai Jain Caves. There are also two rock-cut caves, one of which houses twelve life size sculptures of Vishnu. The temple is considered one of the oldest stone temples in South India. The temple is maintained and administered by Department of Archaeological Survey of India as a protected monument. Narthamalai was originally called Nagaratharmalai on account of the business men (called Nagarathar in Tamil) who were active in business in the Trichy - Pudukottai - Madurai regions. The Nagarathars are attributed to the major contributions in terms of the canals, temples and religious establishments in the region. Narthamalai was ruled from the 7th to 9th centuries by the Mutharaiyars who were feudatories of the Pallavas. The region was later captured by Medieval Cholas. Though the temple is called Vijayalaya Choleeswaram, the temple was originally built by Muttaraiyar lieutenant, Sattan Paliyili, during the seventh regnal year of Pallava king Nripatungavarman during 862 CE. As per some accounts, the temple is believed to have been built by the first king of Medieval Cholas, Vijayalaya Chola (848- 891 CE), but the view is highly debated. As per the inscriptions, immediately after the construction, the temple was damaged by rains and lightning. The restoration work was carried out by Tennavan Tamiladirayan. In modern times, the temple is maintained and administered by archaeological department of India as a protected monument. The temple is located in Narthamalai, a rockyhill in Pudukottai district in southern Tamil Nadu. The other portions of Narthamalai houses the 8th century Jaina Abode, the Aluruttimalai Jain Caves. There are also two rock-cut caves, one of which houses twelve life size sculptures of Vishnu. The temple is considered one of the oldest stone temples in South India. The central shrine is surrounded by eight shrines, out of which six are still present. The main shrine faces West and the sanctum houses the image of Lingam, an iconic representation of Shiva. The walls of the sanctum are plain, unlike later Chola temples that have niches to house different images. The sanctum is approached through an Arthamandapa, a hall supported by pillars. The pillars are ornamental with rectangular shape in the bottom and the top and octagonal shape in the middle. The vimana, the shrine over the sanctum has a semi-spherical shape having four storeys. The sanctum is guarded by Dvarapalas on either sides. The inscriptions are made on the base of the Dvarapalas. There are also two rock-cut caves, one of which houses twelve life size sculptures of Vishnu. The temple in a combined rock-cut and Nagara architecture is an early example of Cholan Art, continuing the tradition of the Pallavas. It is believed that the temple was the inspiration for the Gangaikonda Cholesvarar Temple built by Rajendra Chola I (1014-44 CE). The sanctum (garbhagriha) has four storeys in Omkara, shape of Hindu symbol Om. There were originally eight subsidiary shrines around the temple, out of which six are still existing. Each of them is identical with a semi-spherical top and a four pillared Madapa in the front. The Vimana, the shrine over the sanctum has sculptures of Uma, Shiva, Dakshinamurthy and Saptamatrikas. The individual images retrieved from the place are maintained in the Pudukottia Government Museum. The temple is the foremost structural of the Chola kings, who would later on go on to make Great Living Chola Temples in the next 300 years, declared as UNESCO as a World Heritage Sites. The temple is first among South Indian temples to incorporate Nagara and Vasara styles to be incorporated in the vimana. ^ a b V., Ganapathy (5 November 2004). "Classic example of Chola architecture". The Hindu. Retrieved 14 November 2015. ^ G., Jouveau-Dubreuil (1994). Pallava Antiquities - 2 Vols. Asian Educational Services. p. 16. ISBN 9788120605718. ^ Morley, Grace; Sengupta, Arputha Rani (2005). God and King, the Devarāja Cult in South Asian Art and Architecture. Daya Books. p. 1448. ISBN 9788189233266. 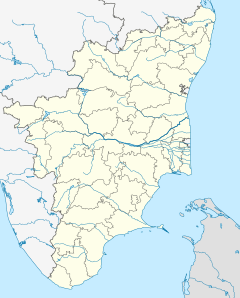 ^ "Alphabetical List of Monuments - Tamil Nadu". Archaeological Survey of India. 2011. Retrieved 14 November 2015. ^ Singh, Sarina; Benanav, Michael; Brown, Lindsay (2013). Lonely Planet India. Lonely Planet. p. 2478. ISBN 9781743217931. ^ Ramaswamy, Vijaya (2007). Historical Dictionary of the Tamils. Scarecrow Press. p. 195. ISBN 9780810864450. ^ a b Rao, A.V.Shankaranarayana (2012). Temples of Tamil Nadu. Vasan Publications. pp. 162–64. ISBN 978-81-8468-112-3. Sastri, K. A. Nilakanta (1955). The Colas: With over 100 illustrations (Madras University historical series) (2nd ed.). University of Madras. pp. 699–701. ASIN B0006CNQCG. Wikimedia Commons has media related to Vijayalaya Choleeswaram. This page was last edited on 6 January 2019, at 12:22 (UTC).